Known as “La Negra Grande de Colombia” (The Great Black Woman of Colombia), Leonor Gonzalez Mina was one of the first Colombian musicians to travel and become well known internationally, bringing Colombian folklore beyond its borders. For her country she became a widely admired source of national pride. At the age of 18, Leonor Gonzalez left her home in Robles, not far from the banks of the Cauca river in northwestern Colombia. She aspired to become a performer, and not six months later she found herself in Paris performing Colombian folklore on a world tour that would take her through the capitals of China and the USSR. 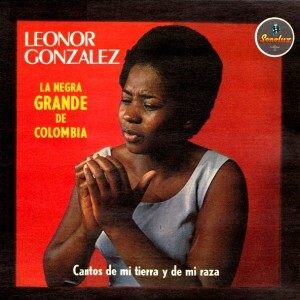 Upon her return to Colombia, this is the first record she published. This music itself, as well as its broad admiration in Colombia, is a demonstration of just how integral african culture is to the Colombian folklore. Leonor herself is a direct descendent of African slaves, many of whom, in colonial times, escaped their masters to found their own independent black communities, ripe with their own stories, legends, music and religion, much of it surely unknown to this day. One of her most famous songs, and perhaps my favorite on this record, is based on a poem of the same name by Antero Agualimpia which in turn tells the story of a mythical black fish, “Tío Guachupé”. At the time, this story was part of an oral tradition probably well known to most black inhabitants of the region. “Tío Guachupecito” opens with a vivid description of the Colombian pacific and the closeness among its black inhabitants. – Uncle Guachupecito, sit sit sit! – Little bird, here there are no more cousins, little bird, no more. The song describes the attempts of children to get the attention of Tío Guachupecito, paddling his canoe down what is probably the Cauca river. Their calls to him are interspersed with imagery of the Cauca region, made moving and very real by Leonor’s incredible voice. At the end of the song, the children are unable to get Tío Guachupecito to stop, and he and his canoe disappear behind the bend of the river. Each track on the album is a treasure, but here I’ll include two more of Leonor’s own personal favorites that she indicated in a recent interview. She noted that she has seen their sentiment reflected in different periods of her life. of so many ancient painters. Finally, “A la mina [no voy]” is sung from the perspective of a black slave, forced to work in a mine by a rich white landowner. In the song he refuses to go to the mine, and declares that despite the chains he wears, he is not a slave. Leonor Gonzalez is still alive and well at 79 years of age, running social programs for children in her Colombian hometown. She has published more than 30 records, acted in movies and television, toured the world, and has even been elected to public office in the Colombian federal government.